Negative Reaction - ZineWiki - the history and culture of zines, independent media and the small press. 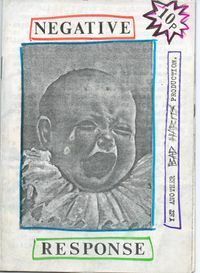 Negative Response was a one off A5 sized zine produced in the UK by Adventures in Reality editor Alan Rider. Negative Response contained satirical articles and cartoons on the local Coventry scene in the early 1980's. This page was last modified on 9 September 2018, at 11:54.